If you've been thinking about reenergising your home with a bit of earth friendly power in an attempt to start weaning your household off fossil fuels yet can't get past the vision of a giant wind turbine plonked in your backyard, it's time to do some research. For a start, individual turbines are expensive (up to £3,000 to install) and won't produce much electricity in built up areas to be worth the effort. Solar electric panels are a more workable option but are also costly to install. Wood burners, glazed windows and good insulation will save a lot of money in the long term and prevent the burning of fossil fuels for conventional electricity but again, the initial outlay costs can be too much for some families. The alternative and more feasible eco energy option is to switch to a renewable energy provider. In the UK there are a number of companies that use renewable sources to produce their electricity. Good Energy only provide electricity that is generated from wind, water, sun and biomass. Green Energy is another good UK provider and offer customers the option of becoming shareholders, offering a space to voice your eco agenda. 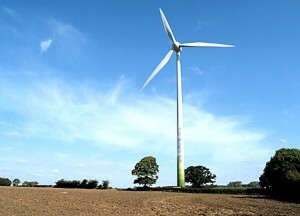 Ecotricity is thought to be the most eco considerate of the bunch as they invest heavily in renewable technology; in fact, more per customer than any other electricity provider in the UK (they've built over 12% of England's wind turbines). Plus up to 25% of their electricity supply comes from renewable sources. Ecotricity also donate £16 to the Soil Association for every new customer, directly supporting organic food and farming. By supporting green energy technologies we are contributing to reducing the pricing power of oil. The more we invest in renewables, the more we ultimately save - planet and pocket. If you are considering installing a renewable energy technology in your home visit the Energy Saving Trust as you may be eligible for a grant.